The Passion Week and the Holy Pascha (Passover) is the most important period in the year and the richest spiritually. It is a week full of Holy memories of the most crucial stage of salvation and the outstanding chapter in the story of redemption. The Church chose for this week certain readings from both the Old and the New Testaments, which reflect, the most passionate feelings that explain God's relation with Man. The Church also chose some deep hymns and spiritual contemplation to suit the occasion. In the early Church, our Saintly Fathers used to receive Holy Communion this week with respect and reverence, and act in great humility. While fasting, they abstained from eating any sweet food like honey or jam, as they considered it not appropriate to taste any sweet thing while commemorating the Lord's suffering for them. Some used not to cook anything during that week, as a matter of devotion, and lest cooking should distract them from worshipping. The majority of Christians used to eat nothing but bread and salt. Those who were physically capable abstained from Friday night till Easter Sunday. As a sign of devotion during this week, women used not to put make up or wear jewellery. People devoted all their time for worshipping; they gathered in Churches for prayer and contemplation. The Great Emperor Theodosius was one of the Christian Kings and Rulers who ordered all Government Houses and Business to cease work, to enable people to concentrate on worshipping. Prisoners were also allowed to go to Church and join in the ceremonies of this Great Week, hoping that it would help them to reform. Christian masters also used to relieve their slaves from work all the Pascha Week to enable them to worship the Lord like their masters, without any discrimination. So both masters and slaves were able to worship God and enjoy the effectiveness and depth of this week. Received from a correspondent who requests to be kept anonymous. 14 April 2003. The Editor. 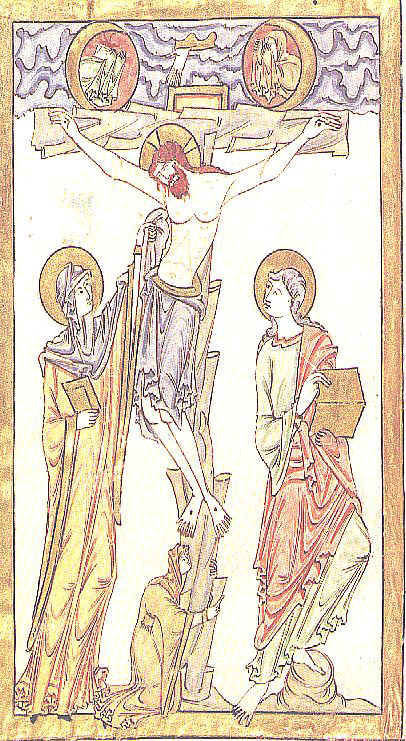 Icon: An Anglo-Saxon manuscript illumination showing the Crucifixion of Christ. From the Gospel-book of Countess Judith.